Running and jogging are no newly invented sports, but lately more and more people restart to appreciate the healthy endurance training in nature. Even in your holidays in your hide-away in Lech am Arlberg you will find countless opportunities to indulge in your favourite sport. Varied running routes and trails for every fitness level are found around your luxury chalet at the Lech Lodge in the Tyrolean Mountains. 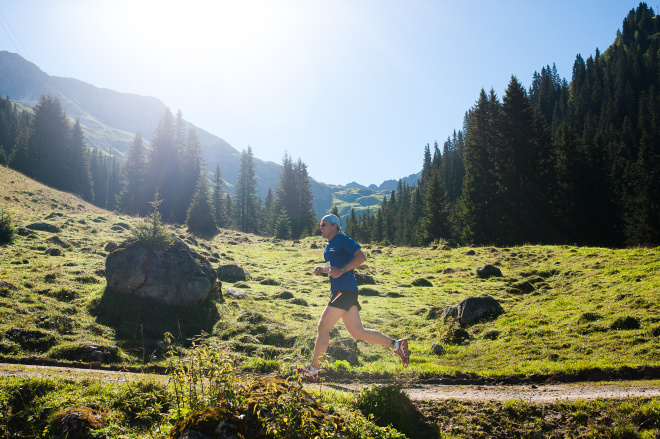 Even beginners can run well in Vorarlberg’s nature: The team of Lech Lodges informs you about running styles, the ideal running equipment and the most beautiful running routes around your charming luxury chalet in the mountains. Probably the best part of running is, that everybody can do it – anytime and anywhere. Regardless of age, fitness and surroundings, you can run, if you just want to. It is only important to find the best running style for your personal needs and to keep some time for training every day. Before you start your training, you should have an overview of your health condition. A medical check is recommended. Be considerate of complaints that are known to you and do not overextend yourself at the beginning. Also a slow start is a good start. Keep in mind that running is not so much about speed and distance, but more about regularity and continuity. Try to take small steps at the beginning. This way you save energy. – Pay attention to an upright posture – keep your shoulders upright and away from your ears, head points straight in front of you. – Let your arms hang loose at a 90-degree angle beside the body. – Try to perform with the whole foot, about a foot length in front of your torso. – Pay attention to your breath. There are different techniques, the main thing is to breathe regularly and to never feel distressed while breathing. – Pause! Don’t mind resting if you feel like it and don’t run too fast. Walking breaks included, you should start with around 30-40 minutes per run. The right path is the one you enjoy most, but at the beginning you should make sure to start on level roads – mountain races should be addressed only with more experience. All in all running in nature and on soft grounds is recommended. Do not run on a full stomach – the last big meal should have been about 3 hours before your run. But remember to drink enough before and after the running exercise. For longer distances it is recommended, to also drink during the run. Don’t forget to stretch sufficiently after the run. In that way you reduce stiffness and sore muscles. The most important tool for a runner represents the right running shoes. Get expert advice on buying your shoes. You’ll find your competent partner in matters of sports clothing and equipment directly in the many sporting goods stores in Lech am Arlberg. Let the experts also advise you on the appropriate functional clothing. While training at the Arlberg you’ll experience a gentle altitude training. The area around Lech invites you to runs in the wild. No asphalt, no traffic, no red lights, no crowds: enjoy your morning run on the autumnal fields and in the colourful woods at the Arlberg and clear your head. Of course you’ll also find many routes for trained runners, especially mountain runners will find joy at the Arlberg. The “Weibermahd rise” offers altitude differences of more than 500 m at a distance of 8.5 km. Also the two-hour 2-valley-round and many others provide highlights in your active holiday in the Arlberg region.